This novel follows Charlie through a difficult but ultimately rewarding freshman year at high school. He has no friends; only his English teacher Bill inspires him, giving him extra reading assignments and challenging him to think more like a “filter” than a “sponge”. “Sponge”-thinking seems to come naturally to Charlie. He watches from the sidelines of life, observing and absorbing information, trying to work out why people do things, how he can be one of them, making mixtapes to mirror the season or his mood. Being a wallflower creates in Charlie a sensitive, introspective individual, but even his teacher Bill encourages him to “participate” in the life occurring around him. Luckily, Charlie accidentally makes friends with a couple of seniors, Sam and Patrick. He almost instantly falls in love with Sam, and gains a gay perspective on life through Patrick. He goes along with what they do - follows them to parties where he once gets served a “special brownie”, gets drunk, tries different drugs, follows them through their miseries, tries out smoking, and fails to understand teenage relationships. The novel is told entirely through first-person letters. Charlie writes to somebody he’s heard of, and thought this person sounded sympathetic. Through these letters, Charlie writes in a detached, observing manner, and can’t seem to understand why his actions or inactions produce those consequences. Apart from therapy through letters, Charlie also sees a psychiatrist whom, he says, keeps asking strange questions and he’s not sure where they’re going. His family help as much as they can, but his parents cannot really relate, his brother is away at college playing sports, and his sister is dating and crying a lot. I very much enjoyed the way Charlie’s introspective nature causes him to pick apart his experience of high school life. I loved the immersion into his world and the way he views it. It felt raw, and real, and the character of Charlie felt like all of my insecurities bundled into one person who just needed reassurance, a hug, and a little guidance. I felt sympathy and empathy for Charlie the whole time in a powerful way. 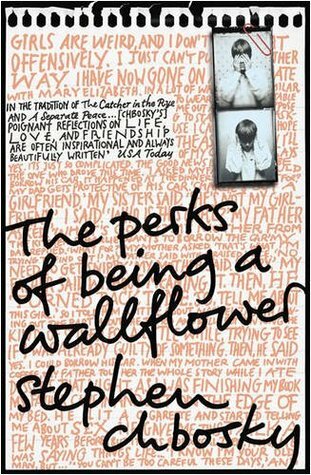 The Perks of Being a Wallflower is a story I already knew, as I had seen the movie. I don’t usually like to do things this way round, but the story was one I fell completely in love with. When I watched the movie, I felt that I could really, truly relate to Charlie and his difficult passage through high school. A quotation from the movie (which I didn’t find in the novel) which resonated clearly with me, when Charlie is acknowledged as being the all-seeing wallflower, was, “I didn’t think anyone noticed me”. Having now read the novel, I am not of the common opinion that “the book was better than the movie”. I think they each have something to offer, in their own right. Even though not everything that is in the book was included in the movie, I felt that the movie successfully encapsulated the meaning and feeling of the novel.